AdAdapted and Chefling, AI Kitchen Assistant App, Team Together to Offer Add-to-List Technology to Even More Consumers. Ann Arbor, MI, March 01, 2019 --(PR.com)-- Chefling and AdAdapted are excited to announce a new partnership, benefiting CPG brands by helping them reach shoppers in the apps they use to cook, plan and shop. This new partnership will make ads and shopping lists more useful to Chefling users by equipping them with the increasingly popular Add-to-List technology combined with Chefling’s AI-driven personalized recommendations while at the same time expanding the AdAdapted exclusive network of grocery list-builders. Chefling, a highly-rated smart kitchen app, is the first app solution to provide inventory organization, intuitive recipe suggestions, and online grocery shopping all in one place. Chefling allows users to add missing ingredients to their shopping list with one touch by identifying what’s missing from their food inventory, and syncs shopping lists in real-time with family members. Providing a smarter cooking experience through their proprietary UltraConnect™ technology, Chefling has the ability to coordinate directly with smart kitchen appliances for any recipe. That, combined with the ability to handle all your grocery shopping needs and offer seamless hands-free connectivity with Amazon Alexa, Google Home, and Siri voice assistants makes Chefling a very useful kitchen assistant that users continue to revisit time and again. AdAdapted’s proprietary Add-to-List technology is currently integrated into dozens of popular grocery apps, including six of the ten highest rated list apps in the US, and this network continues to grow as AdAdapted continues to seek out partnership opportunities among the grocery list-building app community. AdAdapted’s exclusive network currently includes widely used apps like Out of Milk (www.outofmilk.com), Our Groceries (www.ourgroceries.com/overview), Buy Me A Pie (www.buymeapie.com) and Big Oven (www.bigoven.com) to name a few. With grocery apps continuing to grow in popularity (retail.emarketer.com/article/grocery-apps-grow-importance/5b352952ebd40003b8491a2b), this space has become an opportune advertising space for CPG brands and retailers. Furthermore, an astounding 80% of today’s CPG purchase decisions are influenced by a mobile device, whether at home or at-shelf (www.outerboxdesign.com/web-design-articles/mobile-ecommerce-statistics). This makes the mobile space a perfect locale to reach consumers in their grocery shopping decision-making state-of-mind. With an exclusive network of apps and proprietary technology platform, AdAdapted provides CPG brands a venue in which they can reach a mobile audience as they make shopping decisions. With unique, native ads, app users experience a non-disruptive, targeted native ad experience. AdAdapted’s platform targets consumers based on things like category engagement, past shopping behavior, and shopping tendencies, and allows consumers to add promoted products to their favorite list from an ad unit. This means for the first time CPGs can measure intent for in-store purchases in real time and no longer have to guess if they reached the right person or if their ads made an impact. AdAdapted (www.adadapted.com) is the number one add-to-list mobile advertising and insights solution for CPG brands and the agencies that represent CPG brands. AdAdapted offers CPG brands the ability to directly target their primary consumers in the apps they use to plan and shop. AdAdapted’s platform places CPG brands in front of consumers with native, non-disruptive ads at the exact moment of decision-making, targeting consumers with laser-like efficiency and getting products on digital shopping lists. 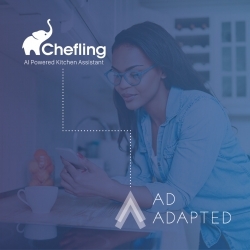 Chefling (www.chefling.net), Inc., headquartered in Silicon Valley, provides the ultimate smart kitchen solution, delivering convenience through a personalized AI kitchen assistant available on iOS and Android. Chefling developed the first smart kitchen app that incorporates inventory organization, intuitive recipe suggestion, shopping list management, voice assistant integration, and UltraConnect™ smart kitchen appliance coordination into one platform to simplify the cooking experience.